Two new games from Epyx promise all-out-and-out fun! 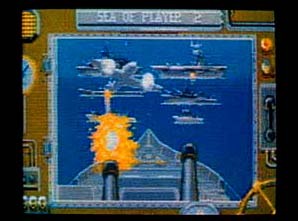 Battleship, the computer version of the classic strategic board game from Milton Bradley pits you against either the computer or a friend. Secretly position your aircraft carriers, submarines, destroyers, torpedo boats and battleships on the grid map. Then the action begins and the "game" becomes a deadly version of hide and seek. Players place their hits to try and destroy their opponent's fleet without having their own ships blown out of the water! One mistake could mean a watery grave in this furious high-seas skirmish. Seasoned Seadogs battle black forces who possess bizarre architectural abilities in Tower Toppler. On the planet Nebulus, your MK-7 Mini-Sub takes you to eight mysterious, rotating towers that have risen ominously from the toxic sea. As a senior operative for Destructo, Inc., you have been sent to topple these terrible towers down into the putrid depths. Speed, coordination and quick judgment are the only traits that will get you to the top in Tower Toppler. Stunning 3D graphics and challenging gameplay will have you hooked from the word "go." Battleship, $29.95. Tower Toppler, $49.95. Epyx, 600 Galveston Drive, P.O. Box 8020, Redwood City, CA 94063,(415) 368-3200. Explore the wonders of computers with a new construction kit from Fischer America. It's called Computing Experimental and it promises hours of educational fun. The kit comes complete with all the switches, lights and wires you'll need to start experimenting with your computer. A comprehensive guide to the construction kit provides an introduction to the programming of machines and robots. All of the experiments are described in detail and only a minimum knowledge of computers and BASIC is required. Simplified instructions and a new wiring harness make assembly easy. $379 (includes kit, interface, software and power supply). Fischer America, Inc., 175 Route 46 West, Fairfield, NJ 07006, (201) 227-9283. Learning to fly your radio-controlled plane or helicopter just became easier. The R/C Aerochopper radio-controlled flight simulation system for your ST puts you as close to real R/C flying as you can get, without the worry of crashing or bad weather. planes, jets and helicopters with your ST. 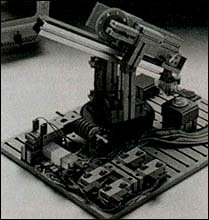 Developed by Ambrosia Microcomputer Products, Inc., R/C Aerochopper is manufactured by Futaba Corporation and uses the same transmitter box and controls as the Futaba Conquest series of radios. R/C Aerochopper is designed to simulate the experience of real R/C flight and puts you at the controls of a number of different airplanes, helicopters, ducted fan jets and even a glider. 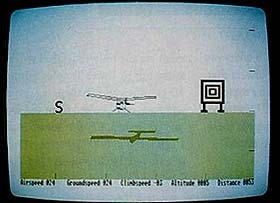 Each R/C Aerochopper Flight Simulation System includes a Futaba Conquest dual-stick radio with interface cable, programmed computer interface cartridge and complete owners reference manual. R/C Aerochopper, $189.95. Ambrosia Microcomputer, Suite 371, 98 West 63rd Street, Willowbrook, IL 60514, (312) 655-0610. Water Fountain Software brings to your children the enchanting world of reading while teaching them the complexities of their computer. The Magic Playground is an interactive animated story that parents and children can read together from the computer screen. Easy to use, it's designed to be just like reading a book. The Magic Playground's story is simple. There are two playgrounds. On one you can interactively play on the swings or on the slide, with the water fountain or in the sandbox; the other is the Magic Playground, where anything can happen and often does. As the story unfolds, your children are exposed to many of the things a computer can do. They will also learn to use the mouse, keyboard, return key, function keys and arrow keys. In other words, your children will have a good time and become computer literate without realizing it. Runs in medium and high resolution. The Magic Playground, $20. Water Fountain Software, 13 East 17th Street, New York, NY 10003. An ST memory-expansion alternative in a solid-state disk drive is now available as a kit from RONSAT Technologies, Inc. The STonehenge kit, based on an Application Specific Integrated Circuit (ASIC), emulates a hard disk by interfacing the ST's DMA port with a block of DRAM. The STonehenge advantages over internal memory expansion include the ability to utilize lower-cost 200 nanosecond DRAM parts, memory expansion in 256-kilobyte increments (eight DRAMs per bank) and nondependence on the ST's power supply. Plus it's external, you don't take your ST apart and data is preserved even through an ST power cycle. When the kit is fully assembled it provides up to two megabytes of very fast external storage. If you need more than two megabytes, the DMA pass-thru feature can be utilized to daisy chain more kits or mechanical hard drives. STonehenge, $169.95. RONSAT Technologies, Inc., 368 Lexington Drive, Buffalo Grove, IL 60089, (312) 520-8003. Do you have a new ST product? If so, we'd like to hear from you. Please send your press release and product photos to Products Update, START Magazine, 544 Second Street, San Francisco, CA 94107.